Au-Tomotive Gold Dodge Ram Head Emblem Polished License Plate Au-Tomotive Gold Dodge Ram Head Emblem Polished License Plate, Dodge Ram Head Emblem Polished License Plate, Dodge Ram Head Polished License Plate, Dodge Ram Polished License Plate, Ram Head Emblem Polished License Plate, Ram Head Polished License Plate, [Auto Gold RAMOEMCC License Plate] - $44.95 : 3rd Strike Performance, Your Source for Late Model MOPAR Performance Parts and Accessories! 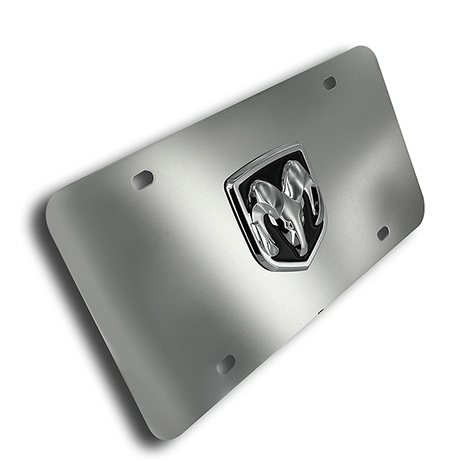 Au-Tomotive Gold manufactures these stylish Ram's Head logo plates using only the highest grade, mirror-polished stainless steel. Hand polishing further ensures that this plate will have a faultless appearance. Proudly display your Dodge spirit and give your vehicle a truly custom look with an Au-Tomotive Gold Ram's Head Polished License Plate.